$99 Monogram Necklace Sale with Free Shipping! The early bird gets the worm and the early holiday shopper gets this great deal on a $99 monogram necklace with free shipping from Carolina Clover! Shop now for daughters, granddaughters, nieces, mom's and grandmom's and your BFF! 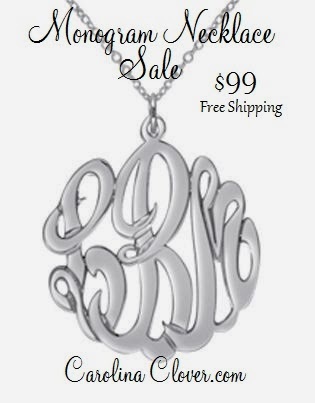 The $99 sale is for a 5/8 inch sterling silver monogram necklace and free shipping. All other sizes are also on sale at $15 off and free shipping, so if you would prefer a larger size pendant they are also on sale! Wouldn't the women in your life LOVE to have this monogram necklace as a gift? Order today from CarolinaClover.com as our production timeline is up to 4 weeks in addition to shipping. The absolute ordering cut off date to have this under the Christmas tree is December 2nd. To take advantage of this great $99 sale, you must place your order before November 15th. Click here to view the Monogram Necklace Sale on CarolinaClover.com!